Many of us admire Gordon Ramsay for his shrewd culinary confidence. We watch him on TV and in videos dishing out fantastic food, colourful comments and incorrigible insults. We hear his comments and feel the burn of his insults, but how many of us can truly claim to have tasted his food? Apart from being lucky enough to actually have the man himself cook something for you, the closest that the less fortunate, like us, can get to tasting his food is to dine at one of his restaurants. So, long before the arrival of Bread Street Kitchen Singapore and the possibly upcoming Restaurant Gordon Ramsay Singapore, we gave our neglected senses a treat by heading to Restaurant Gordon Ramsay, his flagship three-Michelin-star restaurant on London’s Royal Hospital Road. Well actually, it wasn’t the first Gordon Ramsay restaurant that we had ever been to, but that’s one of the things that drives us to pursue our dining adventures. It was August 2012. I had just completed my year-long master’s programme in London and she had just arrived there to join me in my final days as a student. The restaurant was the perfect setting for us to celebrate our reunion, after spending nine months as a married couple apart in different countries and timezones. We had the lunch menu and ate in constant hope that Gordon Ramsay would make an appearance at his own restaurant. It didn’t happen. Nevertheless, we enjoyed the overall experience. Service was decent, but not at a level at which it left an indelible impression. Food-wise, everything was well-executed and very beautifully presented. For starters, we had the smoked potato and poached hen’s egg ravioli with pak choi, roast chicken jus and leek velouté and the salt cod brandade, ‘Tartine’, noir de bigorre ham, piquillo peppers, olives, confit tomatoes and quail’s egg. Our main courses were the roasted rabbit loin with Bayonne ham, confit tomato, marjoram, broad beans, grelots and chargrilled charlotte potatoes and the fillet of Cornish pollock with chorizo couscous, baby squid, artichoke and spiced tomato jus. For desserts, we selected the roasted pineapple with coriander financiers, coconut sorbet and vanilla cream and the banana parfait, peanut butter mousse and bitter chocolate sandwich with caramelised bananas. Two surprises were served – a pre-appetiser and a post-dessert. 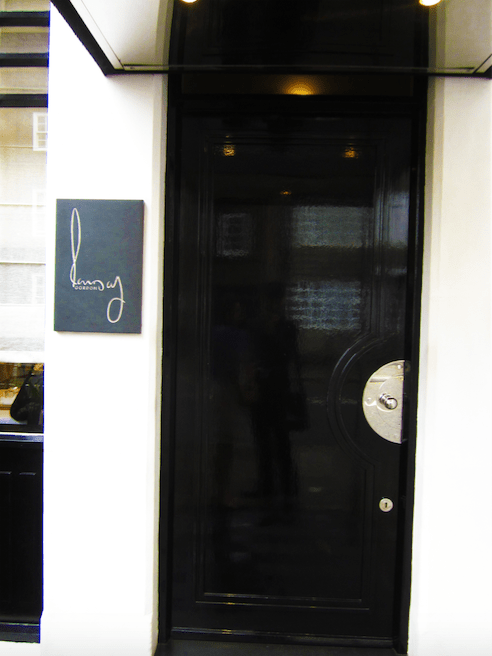 While we enjoyed our experience at Restaurant Gordon Ramsay, it unfortunately does not stand out in our memory like the way some other restaurants do. In fact, one of most memorable dining experiences we have had to date is at his less Michelin-star rated Pétrus in Knightsbridge, which we will cover in a future post. For now, we leave you to salivate at pictures of our meal at the restaurant below.